It’s a rainy Saturday here in Ohio. Over the next few days, we’re expected to get up to 6 inches of rain. Seriously, it hasn’t stopped in about 18 hours, and it’s not supposed to stop for 2 more days. With no motivation to actually leave the house, it’s been the perfect excuse to stay in and be lazy for a change. 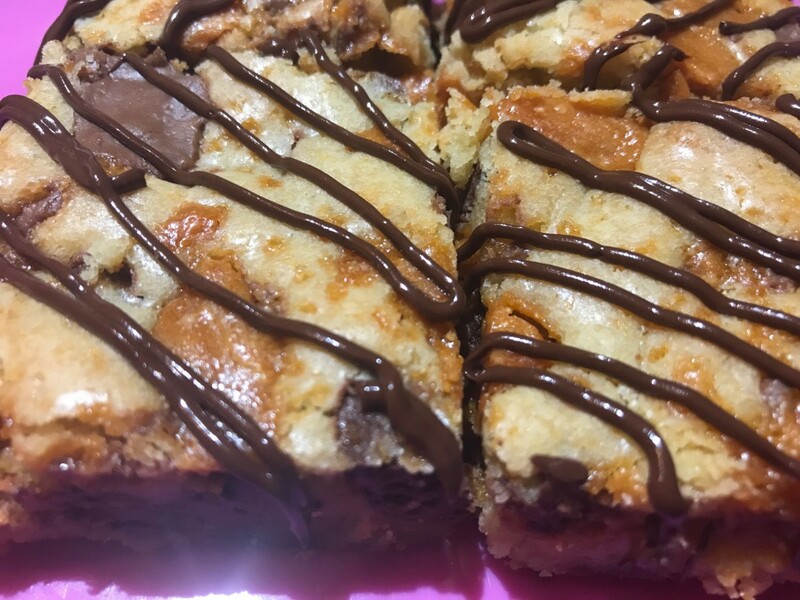 It has also left plenty of time for baking and testing out my latest recipe…Butterfinger Blondies. Butterfinger has always been one of those sweets that I’ve enjoyed, but don’t always think of. 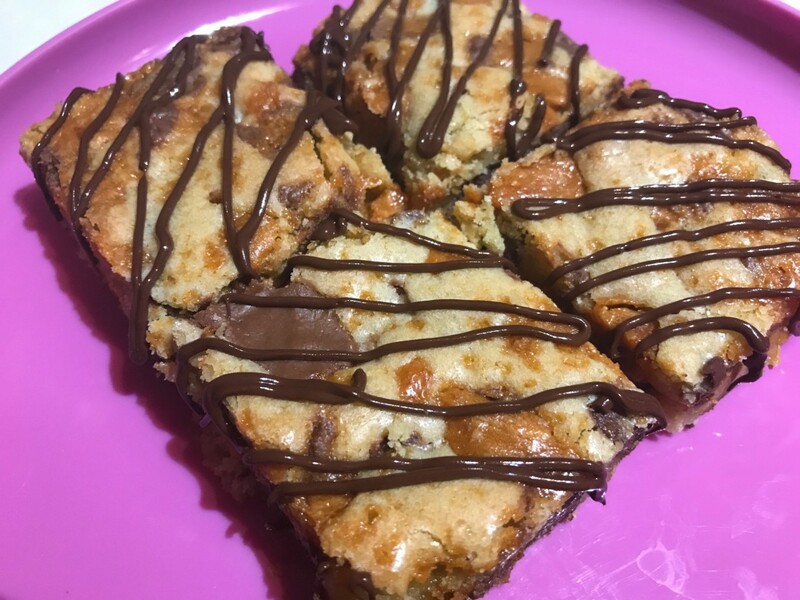 However, when I was trying to come up with a new bar recipe, Butterfinger seemed like the perfect thing to incorporate into them. I mean, come on. Buttery cookie? Chocolate? Butterfinger? Can you say YUM?!?! I feel like, with a lot of bar and brownie recipes, the add-in flavors are so subtle and overpowered by the base. That is not the case with these Butterfinger Blondies. The Butterfinger flavor really comes out well. This recipe starts with a chocolate chip cookie base. Layered in the middle is crispy, peanut buttery goodness spread throughout with more chocolate chip cookie on top. How can you go wrong? Answer? You can’t. It’s simply amazing. Now, I have to admit that the first run at these was not exactly a success due to a simple mistake on my part. See, I usually have a 1/2 cup scoop in the flour container, however, I’d taken it out so that it could get washed. A 1/3 scoop went in to temporarily replace the 1/2 scoop while it was in the dishwasher. I’d forgotten I had done this. So, when it came time to add the flour, I did four full scoops plus half of a fifth scoop. This barely equaled 1 1/2 cups flour total. What happened was the edges ended up getting really dark, while the center was still really gooey and not set at all. Oops! Eventually, I made the executive decision to remove them from the oven to see how they cooled. What I ended up with was something that tasted good, but that’s about all they had going for them. I drove myself crazy for about an hour trying to figure out what had gone oh-so-wrong. Once I realized my mistake with the flour, I knew I had to try them one more time. And you know what? Preheat oven to 350° F. Generously spray a 9" x 9" pan with cooking spray. Beat butter and sugars until light and fluffy with a hand mixer in a medium-sized bowl. Add eggs and vanilla and beat until combined. Mix in baking powder and salt until combined. Add flour, mixing slowly at first. Turn hand mixer to medium speed and mix until well combined. The batter should be slightly sticky. Press half of the mixture into prepared pan, spreading evenly. Crush 4 of the Butterfinger, sprinkling pieces evenly over batter. Press down on pieces lightly. Press remaining batter on top of Butterfinger pieces, spreading out gently to cover evenly. Crush remaining Butterfinger bar and sprinkle evenly across the top. Bake until a golden brown and slightly soft in the middle, about 25-30 minutes. Oh boy, from the bottom to the drizzle, these look so good. I love butterfingers and blondies, so this is the perfect match up. Sorry to hear about the issue with the flour, glad you got the recipe right 🙂 These look delicious! Butterfinger is actually one of my weaknesses. It looks really delicious and looks so easy to prepare, seeing this makes my mouth watering. I love baking a lot and this recipe looks so easy to make and looks really delicious, I will definitely try this for my kids. Oh my gosh- this recipe looks amazing. We love making desserts so we need to try this one soon because we never made butterfingers before. They look amazing! Sadly we don’t have butterfinger bars here in the UK and it would cost a fortune to get them here. I’m going to save the recipe in case I can find a suitable replacement to try instead. Thanks for sharing! Yum they are looks delicious. Hope the rain stopped. Oh. Em. Gee. These look too good to be true. I need to get started TODAY. WOW, these look and sound gorgeous and just love the combo of flavours! Wow! I would love to try making this recipe! My husband would absolutely love these. This is my kind of weekend treat. I love blondies, and these look delicious. I’ll have to try these soon! Oh my gosh! Really? This is the best, ever. I can’t even imagine what this would taste like with Butterfingers. I pinned this. Can’t wait to fix it. Those look delicious! I miss your baking! Thank you! If you do make them, be sure to let me know what you think! Thanks for visiting!